CD20-negative diffuse large B-cell lymphoma (DLBCL) is a rare and heterogeneous group of aggressive lymphoproliferative disorders. Described variants of CD20-negative DLBCL include plasmablastic lymphoma, primary effusion lymphoma, large B-cell lymphoma arising in HHV-8-associated multicentric Castleman disease, and anaplastic lymphoma kinase-positive DLBCL. CD20-negative aggressive lymphoma represents a diagnostic challenge given atypical morphology and lack of expression of B-cell markers. These are also hard-to-treat lymphomas with high rates of chemoresistance and relapse in addition to poor survival rates. 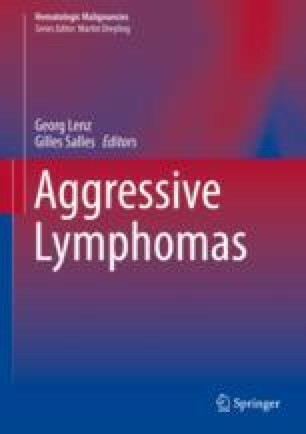 The present chapter aims at summarizing the current knowledge on the biology of the distinct variants of CD20-negative DLBCL, to provide future therapeutic directions based on the limited data available and to increase awareness toward these rare lymphomas among pathologists and clinicians. NCCN guidelines version 3.2017. AIDS-related B-cell lymphomas. AIDS-4. http://www.nccn.org/professionals/physician_gls/pdf/nhl.pdf. Accessed 30 May 2017.